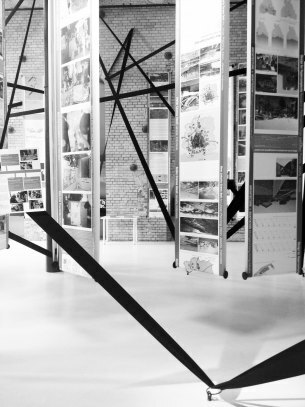 The short essay "On Smart Grids" reflects upon the spatial installation and grid-like exhibition structure, realized at Aedes Berlin, is part of the publication Smart City - The Next Generation, published by Aedes Berlin. 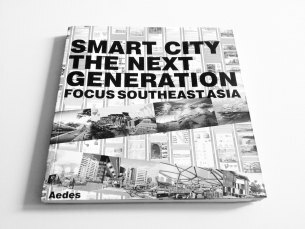 A catalog accompanying the AEDES exhibition Smart City - The Next Generation / Focus South East Asia. Within the scope of the design seminar Grid Structures a group of 23 students from Düsseldorf University of Applied Sciences, Faculty of Design, developed spatial concepts based on the notion of grid and network structures: open spatial interfaces for the exhibition Smart Cities – The Next Generation at the Aedes Architectural Forum in Berlin. 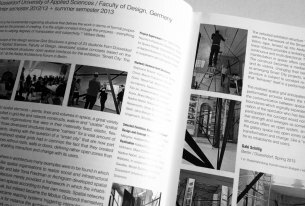 By instrumentalising spatial basic elements – points, lines and volumes in space, a great variety of students works resulted in grid-like and network constructs, walk-in and „usable“ spatial geometries and relational mesh organisations that were in their materiality fixed, elastic, flexible, rigid or movable. All of those developed structures became „carriers“ for a vast amount of architectural and artistic projects, dealing with the question of a „smart city“ that are now part of the exhibition. All of the developed spatial grids had in common that they created non-architecture-like open spaces without roofs, walls or doors, defining rather open zones than boundaries or closed spaces - enabling interaction and change with its users. It was specifically during the 60s, where in architecture many examples were to be found in which architects were investigating grid-like spatial organisations to realize social and infrastructural relations of space. Buckminster Fuller earlier, later Yona Friedman or the group of Archigram developed spatial models and geometries where architecture merely provided a framework in which the inhabitants and users might construct their own spaces according to their own needs. Spatial networks were considered not to be merely visual, but instead became the Modus Operandi themselves for their inhabitants. Those networks became reacting systems triggering interaction with their users. Today in contemporary art there is for instance the architect and artist Tomás Saraceno who investigates the notion of the network on a constructive and atmospheric level. 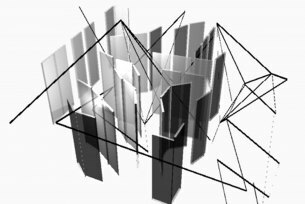 His spatial geometries articulate themselves physically in real space, instrumentalising specific materialities and techniques of construction.